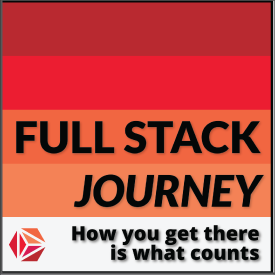 Full Stack Journey tells personal stories about the ongoing quest to become a full stack engineer: an IT pro who can move among multiple silos and work across multiple layers of the modern data center. Episode #5 of the Full Stack Journey Podcast features Patrick Kelso, an independent consultant who works in the UNIX/virtualization/cloud space. Brent Salisbury is today’s guest on Full Stack Journey. As someone who transitioned from network engineer to software developer, Brent is ideally suited to share his experiences. The Full Stack Journey talks with Matt Oswalt about the intersection of network infrastructure, software development, and automation. On today’s Full Stack Journey podcast, Bart Smith shares some details about his journey from being a Microsoft-centric infrastructure engineer to what he calls a cloud-native full stack engineer.